Hoo-Ha -- you're back! I, on the other hand, never left. I've been checking this site every day since the last posting -- really! But... I checked it too early this morning to find this... this... gem! A new entry! So, whadda I think about it? I think it's very good but maybe a bit wasted. Why wasted? Wasted because it's such obscure subject matter. Most people don't know the writer or that quote. Wasted because it's obscure but also because it's very, very clever. It's a complex thing that we get plunked down into and can maybe not get up to speed fast enough to fully appreciate the cleverness. How is it good? Well, just look at it. It's gorgeous. Great character design and emotion. 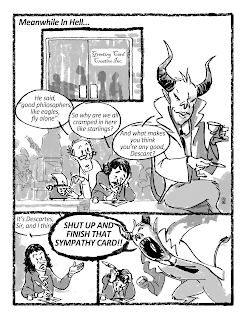 The devil looks cool and then very scary in the last panel. His nose is... disturbing. It makes him alien and creepy. The background modelling is loose and fantastic - particularly the little guy with the moustache and his computer. The "rough" shading is very kinetic (especially on the devil's arm, at the end!) and keeps things from being too cold or precious. Every teacup and saucer is held with precise fingers. This is a masterfully done piece. I'd love to see this effort applied to something more long form or more accessible. You know, maybe something with some 'splosions? Wasted?! WASTED?! Awww. Dang. I get your point. But you got it, so it's not entirely wasted, you Philosopher, you lover of wisdom, you! 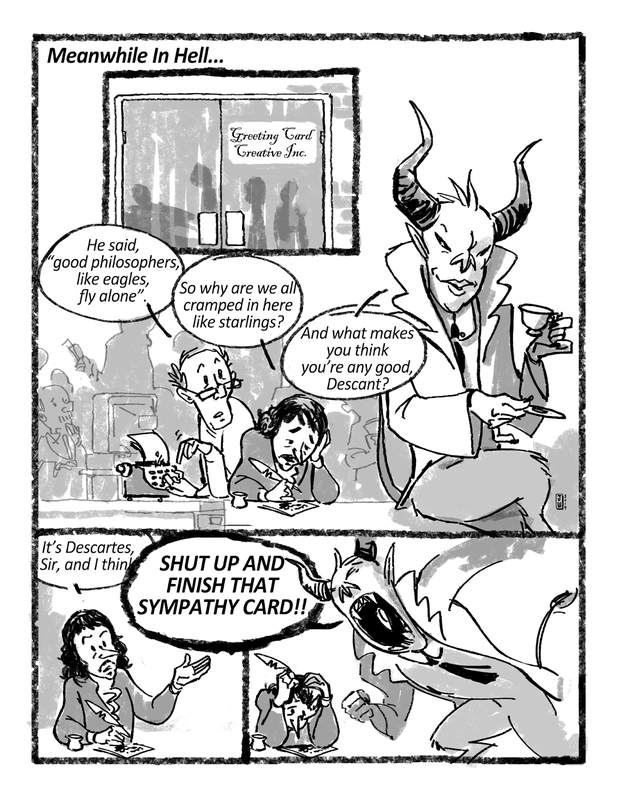 Didn't you write your PHD on Descartes? I'm glad you like the drawings and character designs. I like the devil, he is creepy and disturbing and weird - hard to do. Sometimes I just let my pencil go and see what happens which can lead to odd lines etc. I'm sure you know that trick. I am glad the shading worked for you. I like that rough shading, but I am aware it can be too busy at times, and maybe distractinating. Long form. HA!! 'Splosions. Riiiight, uh huh! In the immortal words of Kant... "Thoughts without content are empty, intuitions without concepts are blind. And don't get me started about comic books!" Well, in the immortal words of Michael Bay - "Get those explosions in there or you're fired!" He said it. He did. I bet he said it to Bumblebee, and look what he got. Starring roll, but... ouch!